The Gas Log Guys are awesome! We were on a tight schedule. They quoted me an in stock item and confirmed it could leave the warehouse same day and go FedEx ground. I was expecting it in two days and it arrived the next day. We were completely impressed by their product knowledge, attention to detail and timeliness. The 24 in split oak non vented set was well above expectation and replaced a cheap set that didn't last. Well worth the money. I recently purchsed this gas log set from Shoppers Choice (i.e. Gas Log Guys) and I'm very happy with it. It was easy to install, and the logs are a high quality product. Everything arrived just as described online and this vent-free set puts off a ton of heat into my home (with my damper closed). I am excited that these logs have a lifetime guarantee....you can tell why they do when you feel they weight they carry. I also bought a fireplace door to go with the logs and it really dresses up my living room. I bought the adjustable flame remote and I would definately recommend getting a remote especially if other family members will be operting it (a remote is much easier for my wife than reaching inside the fireplace). We live in a condominium with cathedral ceilings in the living room, and until recently, a standard wood-burning fireplace. Since the condo is on the second floor, carrying wood up the stairs was difficult and storage was also a problem. My parents gave us a gas log installation for Christmas. Gas Log Guys provided great information for Ed, who was assisting the plumber with the installation on which type to purchase for our needs. We went with the 20 split oak vent free logs and they are even better than we hoped for! They look beautifully realistic and provide ample warmth to a room that has always felt cold in the winter. We would highly recommend both the product and this company! We are super happy with this gas log set and maybe our experience will help you with your purchase decision. 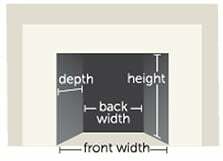 Our application: We have a traditional brick fireplace in our condo living room. The living room has a vaulted ceiling and a lot of glass and this room has never been comfortably warm in the winter. Set the thermostat for 71 and maybe this room stays 68. We were looking for warmth and charm, in that order so after a lot of research and question asking I chose the 20 Inch Split Oak Vent Free set with basic ON / OFF remote. Installation: Is very easy, if you can handle a drill, screw driver and have basic plumbing skills you will be able to install this unit. I did get a plumber to run the gas line to the fireplace. Vented vs Vent Free: While the flames may not be as realistic as a vented set they are very attractive and who stares at the fire all night anyway. 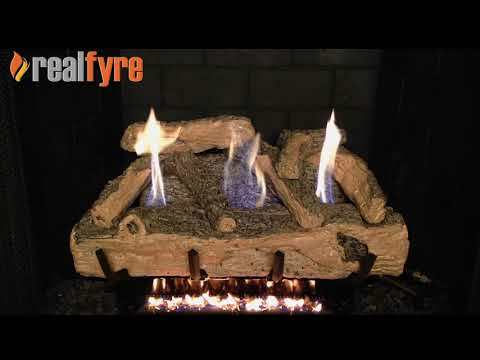 The flames in this gas log set are very nice-looking and they add a nice ambience to the room. Another plus is that you leave the fireplace damper closed so when you want a fire you grab the remote and press ON, simple as that. I think this is much easier than opening the flue damper and then closing it after each use to prevent room heat from going up the chimney. Warmth: This is the best part. The vent free gas log set adds heat to our living room. Now with the thermostat set on 71 the living room temperature reaches 74 or higher because of the heat generated by the gas log set, additional heat where we want it, where we are sitting and this is with the gas volume set to low. Cost to operate: We have used the gas log set for about 50 days, most of December and half of January. We just received our gas bill and held our breath because we have operated the gas logs every day for about four or five hours per day. OK it is not a fair comparison because we did also add an additional R30 insulation in the ceiling BUT our CCF of gas usage was down 15% from the same billing cycle last year with the same 28 degree average outside temperature. I'm not saying the gas logs will decrease your gas bill, but they did not increase ours. It seems like the gas logs are a very efficient heat source which puts the heat where we want it. In our case the thermostat is nearby so the heat from the gas logs satisfies the thermostat and the gas furnace cycles much less frequently. Of course some of our back rooms may not be the 71 degrees set on the thermostat, but I don't really want the bedroom warm anyway. So, we have used this gas log set for four or five hours every day for a month and a half and we are both very happy. We feel it may be our best purchase ever! CON: I did have a problem with the gas logs not igniting as quickly as I thought they should. I spoke with tech support at gaslog guys and found them very helpful. I ended up bending the pilot flame bracket a small amount so that the pilot was more directly aimed at the burner assembly, this cleared up my concern. Also, after I installed the gas log set I did smell an annoying odor but this cleared up and I assume it was a chemical from the manufacturing process burning off of the ceramic logs. We use this product to off-set our heating costs and the added beauty is a bonus. These were exactly what I wanted, wide range BTU output with a very beautiful flame pattern and inexpensive. Is electric required for these? Hi, Dan! These do not require any electricity. The remote and receiver are battery operated and the gas log set is operated by gas.